Adult, Child, Toddler now includes infant sizes! 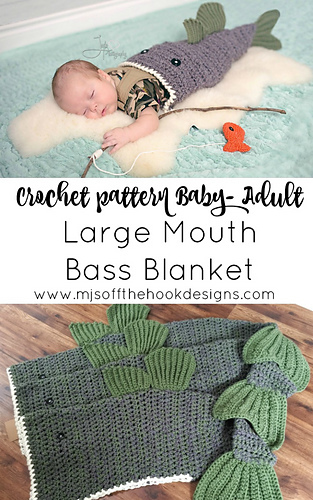 This is a PDF crochet pattern for a soft bulky Large Mouth Bass blanket! Perfect to cozy up with on the couch. 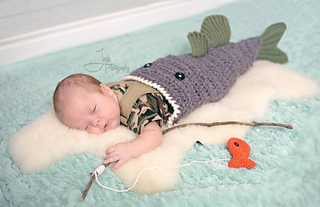 I designed this blanket for the fish lovers out there!! Also as a boy version of my Bulky & Quick Mermaid Blanket ( http://www.ravelry.com/patterns/library/bulky--quick-merm… ). It is designed to cocoon only around the calves and feet, the rest of the blanket opens up. I designed this pattern to work up quick. It’s a simple design suitable for a beginner. The body of the blanket uses 2 strands of bulky weight yarn with a Q hook. The fins are made using 1 strand of bulky weight yarn with a 9mm hook. This pattern comes in three sizes: preschool, child, and adult. The pattern now includes infant sizes!!! You’re welcome to sell your finished items from this pattern. When selling items online I would love you to reference me as the designer! You must use your own photos to sell your work. All my images are copyright protected and cannot be used to sell your items.